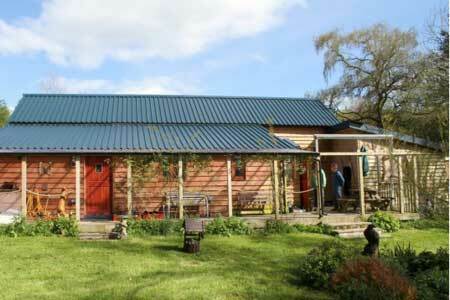 ﻿ Mid Wales Bunkhouse at Woodhouse Farm, near Rhayader, Mid Wales. Booking terms and conditions. Bunkhouse booking terms and conditions. A provisional reservation can be accepted by telephone or email. This must be confirmed with your deposit within 5 days of acceptance, otherwise your reservation will be considered null and void. Final payment of the full amount stated at the time of booking will become payable eight weeks prior to the arrival date, or at the time of booking if this is less than eight weeks from the arrival date. For exclusive bookings (including exclusive bookings of the family room or upstairs dormitory area only) a security deposit of £200 is payable in cash on arrival. For certain types of booking, such as stag parties or college groups the right is reserved to increase this to £400, although if this is the case you will be notified when you make the booking. In any case this will be refunded on departure, less any costs for breakage, damage or additional cleaning, after the management of Woodhouse Farm Ltd have inspected the premises (this includes the garden area as well as the building itself). Exclusive use bookings do not include electricity, which is payable by means of a slot meter taking £1 coins. The cost of electricity is included if you are booking individually. We reserve the right to alter prices at any time without notice. In the event of a price increase for the accomodation you have booked before your arrival date your booking will be honoured at the price you have paid. In the event of a price decrease you will pay the lower price. Any overpayment will be refunded on arrival. Over 6 weeks prior to arrival date- 50% of cost of stay plus any non-refundable charges already incurred by us. Over 4 weeks prior to arrival date- 75% of cost of stay plus any non-refundable charges already incurred by us. In the event of unforeseen circumstances we reserve the right to cancel your booking at any time up to your arrival date, by either telephone or in writing. In these circumstances a full refund of all monies paid will be made and this will be the limit of our liability. Please let us know when you arrive by calling at the house. Your arrival should not be before 1500 hours and departure on the final morning of your stay should be by 1100 hours at the latest. Your booking will be held until 1900 hours on your arrival date. We reserve the right to re-let and consider your booking to be cancelled unless you have notified us (by telephone, email or in writing) of any late arrival, when we will keep the booking until your stated arrival time. All meals must be booked by 1600 hours at the latest. This includes breakfast and packed lunches for the next day. Larger groups are requested to book their meals a few days in advance. All meals are a set menu and whilst we are able to cater vegetarian regret that we cannot offer it as an alternative. We regret that we are unable to accommodate dogs or other pets in the bunkhouse. These rules, most of which are common sense, are intended to ensure smooth running of the bunkhouse, and enable you to get the best from your stay at Woodhouse. Please read and adhere to them. New arrivals should not be before 1500 hours, and the bunkhouse should be vacated by 1100 on your departure day unless prior alternative arrangements have been made. All fire escape routes must be kept clear and all fire doors kept shut at all times. For your safety please see the fire notice and familiarise yourself with the escape routes and fire assembly area. Tampering with any electrical equipment for whatever reason will not be tolerated and the offenders evicted without warning, and without any refund of monies, including the security deposit. The building must be kept clean and tidy at all times. It is the responsibility of the hirer to ensure that the bunkhouse and surrounding garden is left in the same condition on departure as it was on arrival. All rubbish must be disposed of in the bins provided, with glass being kept separate. Official cleaning takes place between 1100 and 1500. For exclusive bookings any cleaning required over and above normal routine cleaning will be charged at £25 per hour and will be deducted from the security deposit. No animals are permitted. The right is reserved to refuse entry to anybody bringing any animal until suitable arrangements have been made for its accommodation elsewhere. If this is not possible the owner will be asked to leave, along with the animal, without refund of any monies paid in respect of the booking. No outdoor boots or wet clothing to be taken into the sleeping areas or common room. These should be removed in either the entrance lobby or utility / drying room. The utility room is available for drying wet clothes. Please consult is if you find that you require this facility and we will assist. No drying or hanging of items on the fixtures or fittings. Do not place anything on top of any heaters. Ball games of any description are not permitted in the bunkhouse, bunkhouse garden or anywhere on the farm without special permission from the management of Woodhouse Farm ltd.
Children must be supervised by a responsible adult at all times. The play equipment on site is not for the use of children staying in the bunkhouse. Barbeques are only permitted in the designated area within the garden. Smoking is both illegal and strictly forbidden anywhere within the building or garden area. Take all valuables with you. No responsibility can be accepted for any losses. All damages and breakages must be reported and paid for. Any spillages should be cleaned up immediately. Parking should be in the designated area only, and in such a manner as to not obstruct the access pathways or access to the campsite. Keep the garden area clean and tidy. Dispose of litter in the bins provided. Respect nature. Toilet paper only in the toilets. Sanitary wear to be placed in bins provided. Please switch off lights and heaters, and turn off taps when not required. Excessive use of water and / or electricity will incur charges and will be deducted from any security deposit. Please respect others sharing the facilities. Please be as quiet as possible, especially if coming in late or leaving early. A late stay charge will be incurred if the accommodation is not vacated by 1100 on your departure day. Full waste recycling facilities are available in Rhayader (car park). The management reserve the right to enter and inspect at any time. In the event of breach of any of these conditions the right is reserved to evict the offenders immediately with no refund of any money, including the security deposit. It is a condition of booking that you have read, understood and accept these terms and conditions and also agree to be bound by the 'rules of the bunkhouse'.